Digital photo books? Have you heard of them before? Do they sound complicated? Well, I have good news for you. 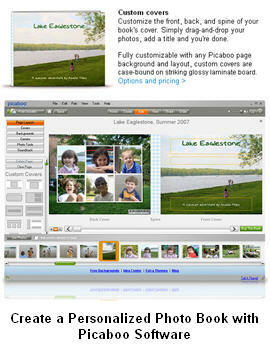 Creating a personalize photo book is a very simple process. 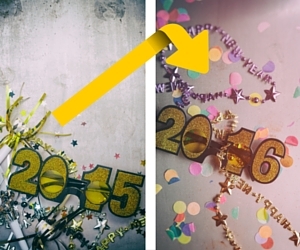 It is a lot of fun and one of the best ways to preserve family photos and the stories that go with them. All you have to do is download the software, have some pictures thatyou want to use and start being creative. Once you are happy with each page of your layout, professionally printed and bound photo books can be ordered for very reasonable prices. current favorite is one called Picaboo! 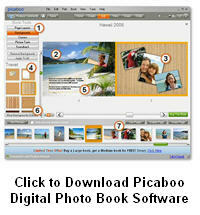 Photo Book software from Picaboo is free to download. 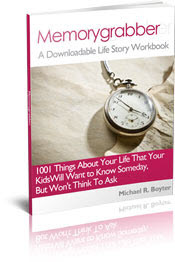 Once downloaded, you can get started immediately. Picaboo will bring up all your photos it finds in your My Photos folder. You simply put a check mark beside the ones that you want to use. descriptive words about each photo. But the magic is in having your creation printed into a full color, professionally-bound, personalized photo book. It is very exciting when you get that book in the mail!